1600 and 1280 res available at pixel ellipsis v3! So pixel ellipsis is a little over 1 year old. We've broken 25k unique visitors in this first year; huge thanks everyone for all the support thus far :D Running this site has been a fantastic amount of fun, crap is the best partner under the sun, I couldn't ask for a better friend to do this with. The site has been changing little bits here and there as our interests shift, so I'm looking forward to seeing how much it'll continue to grow. Having the site has really made my walling/design experience extra special and extra enjoyable. I've been using my Subaru wall and I'm a huuuge sucker for black, white, and red, so I stuck with that color scheme for this wall. Girl vectored off a scan from Saikusa Taisen, also available on MT. Flowers and butterfly vectored from this scan. Paper texture from Mayang, and lace pattern that I converted to a brush from devART. Oodles of inspiration liberally stolen from karincoma and akasha/Heart464's stylish vectoring :] Much thanks to tates and misu via the tat0es proxy for checks and suggests. Browse Keiyaku no Kuroneko Gallery: Recent | Popular. wow, I completely love it! v3 looks sooooooo awesome! Congrats! Love the simple vectoring and the colors work well together! A touch of texture in the background completes the awesomeness~ Great job! Good lord, I didn't recognise it! 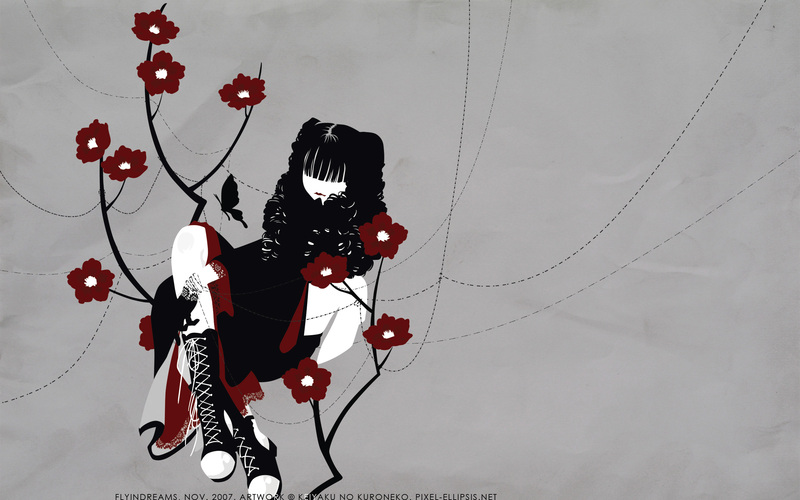 Even after I downloaded it, I recognised the butterflises but the girl didn't look right. It never ceases to amaze me how someone can see a scan and create something entirely different from it! It's nice. Like Saikusa, I like the sort of transformation we see in how the scan currently looks compared to before. Great work, flyin. I'm totally blown away on how you transformed the scan into this, it's just amazing, the vectoring is fantastic, the lace pattern was a fantastic touch, jeezzz I'm just blown away by you. you gave me a new source of greatness..the simple vector looks very nice, I wasnt too sure about it...but now it seems cool for me, especially the fact that it doesnt have an outline...for some reason makes it extremely appealing..
love the vectors but wishing for a much darker bg. Greetings from a fellow sucker for black, white, and red. And congratulations on both the new version of your site and new widescreen monitor :) . LOL but your keeping on this! The colours! The vector! It's so beautiful, I love it. This one went straight onto my desktop. Definitely a fave.